People often approached Rabindranath Tagore to name their sons and daughters——-while doing so, he would also compose a Haiku-type “dedication” to the new born. One of the babies he “christened” was Satyajit Ray and what he composed for Ray is instantly recognizable as one of Tagore’s most famous short poems (though not many know it was for Satyajit Ray). ” I have been gone everywhere, spent a lot of money—travelled to the mountains, seen the sea…….trying always to find beauty. I now realize that all the time I wandered the earth, I missed seeing the splendour that lay before me, just 2 steps from my door—–a dewdrop glistening on a blade of grass”. If ever someone lived upto their “dedication” it was Satyajit Ray. “Pather Panchali” opened the eyes of the world to the beauty that lay in the most unexpected of places—-rural, poverty-striken Bengal. And in the lives of those struggling to live there. If there is something at the heart of Pather Panchali, it is this overwhelming power of life that asserts itself even in the face of poverty, misery and death. Yes Pather Panchali is about struggle. Satyajit Ray had to pawn his wife’s jew elry in order to finance the first stage of shooting. Shooting had to be suspended for lack of finances—wherein Ray prayed for two miracles—that Chunibala Debi (in my opinion, the star of “Pather Panchali”) who played the old aunt, Indir Thakurun, does not die in the interregnum and that the boy who plays Apu does not “physically” grow up. 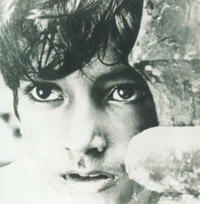 When “Pather Panchali” was released, it became a huge commercial success all over Bengal. My father, who like Apu went to a village school with a straw hut and had a teacher who multiplexed as a shopkeeper, saw the movie when he was a kid. Going to the district capital of Siuri from his native village of Nagari , along with his aunts and other village folk in a cavalcade of bullock carts and watching a movie which told “their story”, was an extra-cinematic experience for him and the people of his generation. Apu was him. He was Apu. I cannot vouch for how much my generation can empathize with Apu’s struggle to manhood—-I suppose perhaps not as much as my father’s. But the sheer weight of the visuals—- the trance-like dance of the raindrops on the pond, the wind rustling through the kaashphool, the sweet vendor’s reflection gliding over the pond —and the timeless simplicty of its story still have the power to hypnotize a generation brought up on cell-phones and laptops….a generation in which many of us have never seen or shall ever see a “real” village. “Pather Panchali” has its critics not the least of whom were gentle white folk who got up midscreening in New York because they were repulsed seeing people eating with their fingers. Back home, one group of haters led by actress-turned MP Nargis Dutt denounced Ray, particularly in reference to the Apu trilogy for “exporting images of India’s poverty for foreign audiences”. 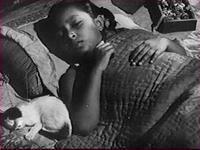 Others castigated “Pather Panchali” for its pessimism and gloominess. Of course, there are several uncharitable reasons for Ms Dutt’s angst against Ray and “Pather Panchali” which I shall not get into here. (If you are still interested, please read the fable about the jackal and the grapes). However the point I wish to make is that such critics fail to perceive the heart of “Pather Panchali”(and the entire “Apu Trilogy)——– that being that poverty, death and deprivation are mere sidelights to the inexorable march of life. My favorite “Pather Panchali” moment is when after Durga’s death, Apu throws the necklace which she stole (and whose hiding spot only Apu knew) into the pond and the lotus leaves cover up the place where the necklace enters the water— the burial of a small secret memory in collusion with Nature. Even apart from its purely artistic value, the Apu trilogy – if you look at it from a holistic viewpoint, amazes me in the whole gamut of human emotions it touches upon. I think Ray himself gists up the theme in “Apur Songsar” when Apu talks of his new novel with Pulu. I don’t think any other movie (aside from ‘Forrest Gump’, probably) comes even close to doing this. 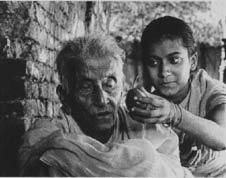 What is amazing about “Pather Panchali” is that such a great work of art was achieved with so little. To me, the “sinking necklace” sequence defines PP. So simple in its execution, yet how many complex emotions it conveys. Just oshadharon. I was actually getting goosebumps as I read through your post. To return to my village experience, it is indeed a surreal feeling altogether.Even today when I get a chance to go there, not only is it supremely de-stressing, but the warmth of the village folks, as if we are all part of one big family, is most humbling, to say the least.Especially since, we all live and believe in nuclear families, selfish gains and “it’s my life” theory these days. Even today, Durga Pujo, Kali Pujo is celebrated with great aplomb in the house…and the experience is ethereal. It’s not like our Kolkata pujo. Yes, we do have a lot of fun with friends…pandal hopping all night round, but barir pujo has a very different charm of its own. Even today the village folk come in hoards for a meal on “asthami” and here there is no difference between the so-called(and now non-existent)”Babu” and proja . A visit there at any other time,evokes as much emotions, happiness and wonder, despite there being that darker side of extreme poverty. Hence, I can identify much better with Ray’s attention to the smallest details and nuances of village life. Thank you Priya…yes I too have seen “barir” Pujo in a village—we used to go fairly regularly to our ancestral home (Nagari in Siuri district)…. on the wall during night-time story-telling in the lamp-light. let us not forget ravi shankar’s critical role in making pp what it is. the trilogy also seems to trace a stylistic arc which parallels the arc of apu’s wakening consciousness from child to man. in the first film, we see apu’s world as if through his eyes, and there is a palpable sense of wonder and excitement in the external world that apu interacts with. by the third film, the story’s contours have moved inside apu’s soul. the innocence is gone, and technique and metaphor must fill in the blanks. And after the movie, even with the bad subtitles (White on white backgrd), i finally realised that it is most definitely the greatest indian cinematic experience of all time. I mean words wont do justice to it. Yes it shows poverty. But it never goes melodramatic ala hindi crappy movies, instead they take it as go’d wish and their own fate. Never does he blame god, not even at the death of his daughter. Nice review, Greatbong. About the necklace scene, I felt slightly different. The boy buried her sister’s little sin in nature’s deep waters, where else could he? And the camera shows lotus leaves (or kochuripana) slowly flowing in to hush up the secret that would now be buried from other people forever. But if you look carefully as the camera leaves the scene, the leaves don’t quite manage to fill the entire gap – a little hollowness remains. I like to think of this hollowness as to symbolise an emptiness in the heart of the boy for his didi and her memories. The magical childhood spent with his sister that would always remain buried in the tranquil of Nischindipur, but a void that Apu is destined to carry in his heart eternally. Yes Anon2…that’s the beauty of Ray…we are allowed to have multiple interpretations…only we have to be careful of overinterpreting sometimes…example the broken light in Mahanagar…..
PS: Dear Anons, after such thoughtful comments, why not just write your name(even first name) at the end so that I can refer to you by something other than Anon1, Anon2…. the song sung by Indir is haunting…..
@Zero and Euphoric Dreamz…a masterpiece indeed. Its said that u can take a bong out of Bengal but cannot take Bengal out of the heart of a Bong. Thta what I can see in the post. Y3es apu trilogy teaches the essence of life. it teaches to fight and to survive. it celebrates the eternal spirit of the human souls and takes us on a journey a journey of truth and simplicity. and got enlightened about the story behind the name of the great storyteller. i have seen the movie when i was young so hardly can i recall any of the scenes except the passing of the train and the joy that the telegraph pole gave them. but after reading ur post i feel the need to see the movie again… now with more understanding. @LGL….Do see them again…these are those rare movies where the pleasure increases the more times you see them—always relevant, forever “new”. It’s a great post Greatbong! I’ve seen the movie uncountable number of times but I still find it as new as ever. It’s truly a masterpiece. The necklace scene is one of my favourite among Ray’s works…I felt that the last necklace scene in Titanic was very similar in essence to that scene. i am very unfortunate that i could not see the movie so far. Today at cochin fistival when i saw it i came to know about the move. This is the best movie ever i have watched and will remain the best for my life. It has really touched my heart. I could not stop my self while waching movie and brust into tears. Millions of thanks to Satyajeet ray for making such a graeat and wonderfull movie for us. This is a great post. But I expected at least a couple of sentences about the writer Bibhutibhusan. I can see that you share a lot of cinematic and extra-cinematic relationships with this movie. This movie is remarkable and is one of the milestones in the history of cinema. I make it a point to watch it once in a while so that I recapture the perspective and sense of what’s been achieved in celluloid. Ray with the greatest empathy, captured the ever elusive and fleeting moments of childhood with nature taking its part, bordering on the impressionist genre. I could see this sweep and control only in Andrei Tarkovsky later. Pather Pachali or “Aam Aatir Bhepu” is a creation of Bibhutibhushan Bandopadhaya , the book is probably one of the most touching and “close to heart” book I have ever read. Putting this story into a cinema was no less than a miracle. Not only did Satyajit Ray make it into a film… he also preserved each of the flavours and enriched them in the story. I would never forget the scene where Durga and Apu wathes the train go by through the “Kashphul”. This was the post that brought me in contact with your blog. I have commented here before as “Sugata Banerji”. However, there’s a small factual error that I had overlooked before and would like to point out now. Rabindranath did not write the said poem while naming Satyajit. He wrote it in his autograph book when the child Satyajit apprached him for an autograph. This is described in Satyajit’s autobiography. I read your reviews of the Apu Trilogy and liked them tremendously. I hope you’ll write some more reviews of Ray’s movies in the future. Looking forward to reading those. pather panchali is one of the most amazing and the best ever film in bengalee litereture.this is satyajit ray’s one of the most wonderful creation.satyajit’s ray’s all the movies are must watch for the bengalees rather all people.according to my opinion till now no films have been made which can be compared with satyajit ray’s any of the film or pather panchali.this film was satyajit’s one of the most wonderful creation. you know what? ur review has taken me back to the odyssey of life, the journey of the road…superb review man…PP is definitely my all time fav;everytime i see my eyes gets moist…(commences with the death of indura thakuran). anyways me getting emotional.shud stop.keep going Arnab.u rock. cries stroll down the heart reading the book with its setting somehere in bengal at nischindipur.The sunbeam sky with dreams of a place where i would be lost in the mother earth along with the innocence of apu and durga has a feeling of endless thoughts which cannot be shared.god has the answers. Nice post-truly intense and deeply personal. I guess we all have our own Pather Panchali moments, our own thoughts and our own ways of being affected by it. I hate to be nitpicking here, but your article begins with a major faux pas. Tagore didn’t write “Bohu din dhore bohu krosh ghure” while christening Ray. It was written on the first page of an autograph book that Ray had carried to Shantiniketan, when he was ten years old. You’ll find this mentioned in almost all major biographies of Ray and also in “Jokhon Choto chilam”, Ray’s own memoirs about his childhood. my brother refuses to watch this film as the sister dies. @Swati: Liar! I saw the movie three times after you grew too “well covered” for me to identify you with Durga. Love being constant, and bodyweight on the upswing, sigh, no wonder that your regard for me is dwindling all too fast. amaar khub bhalo legechhey. in fact i quite lost track of time whilst reading the post. pather panchali evokes varied reactions cutting across all age groups. i remember seeing the movie for the frist time when i was maybe 6 or seven years old. at that time all i could grasp was the pain of durga’s death and the joy of apu and durga’s rain bath and seeing the train. my son had to study pather panchali in class nine and ten – many a times I told him to see the movie but he refused saying that reading the book brought tears to his eyes therefore he would not like to see the movie. indir thakuran moved him more than apu or durga – thats how people react to panther panchali ta bibhtibhusaner pather pancahli hok aar satyajit rayer i hok – it is a great work of art – be it of the literary variety or the cinematographic variety. please check out 25th April The Telegraph, Opinion Section for a beautiful write up on one of Satyajit Ray’s early still photographs. The tagore poem you mentioned. What is it in bengali/what is the name of it so I can find it? A very good blog Arnab … in fact almost all your writing is good ..
– I saw the movie a few months back (late 20s) – and only now was I able to take it in as a whole …the intricacies…… the art that embellished the pain shown in the movie ….truly I was awestruck …. –On a different note – has anyone seen “The Bong Connection” it got sold out at the MOMA yesterday …I couldn’t get a ticket..
Ekti ghaser shisher upore ekti shishir bindu. daRiwalla buror poems & songs become more and more touching as you age. For example the gaan they start you with as a kid: “Momo chitte, niti nritye…” exactly captures the cycle of life and death that you spend an entire post on; all in the meagre 4 stanzas. The last 2 lines of your post sum up EVERYTHING. And, you know, the ‘ghoti’ scene? Where Indir Thakrun dies, and Durga pushes her, she just collapses and the ‘ghoti’ rolls away? I’m a passionate film-lover, and Pather Panchali is one of my eternal favourites. Not the least because in my heart, this 17-year-old still loves to indulge in the pranks of an innocent child– from sitting in the lap of nature, to imagining myself fight against historic characters with fake swords, to just staring and wondering at the magnamity, pain and strange-ness of this world. I may not have to struggle regularly with fate as Apu does, but I share the simplicity that endears him to all. Your review is very touching and true. And hey, PP did have it’s admirers in the West too: Akira Kurosawa was the chief amongst them. I hope you know of Kurosawa’s eternal tribute to Ray: it’s etched clearly in my mind. I saw the film Pather Panchali. I like it very much.Durgas death had struck my heart very well.Attitude of elders towards grandmother is not right. @Dibyo, GB, All: “Bong Connection” was showing at the MoMA? Oh Boy! And I saw it in Bombay. Cool! “Bong Connection” in my view was the best ABCD-centric film of the year ’07. In my humble opinion way, way superior to the namesake. Very subtle, very meangingful, and with a great cast of characters and some of my old fave actors: Victor Banerjee and Barun Chandra! Although some of this film too was unreal and unconvincing, a lot of it was very, very good. I think it will strike much more of a chord. GB, listen for the dialogs of the ABCD’s parents and their buddies in suburban Houston. I’m sure you and a lot of the readers here have heard the same lines from the 1960s and 70s Bengalis all over the US. If you have seen it, please write about it, and if you haven’t, see it and enjoy! There are so many shots in this film that I couldn’t forget in my life. yet the buzzing of the wind near the Kahua( a riverside autumn flower) when Apu and her sister run to see the train.., the whirling frenzy at the pond full of lilies (It is amazing how much I sympathize with the characters in each age). Will “Slumdog”or Adiga’s White Tiger be the new face of Apu’s World? Will it be irreverent of Ray, the iconic Film maker or of the new techie children who no longer hold in awe the huffing and puffing Train a-la apu and durga? Is there a continuity in these dissimilar worlds or its mere suggestion is blasphemous? Have we managed to take Ray out of Bengal to the other parts of India, yet?what about sub titles or dubbing in Hindi? or are the “bongs only” celebrating in blissful isolation? If you are in the Bay Area this weekend, you can watch the trilogy at Palo Alto’s Stanford Theatre. Its a 6 hour marathon starting at 3.15pm, on Feb 21, 22 & 23. See exact timings & theatre address at http://stanfordtheatre.org/stf/calendars/Winter 2009.html. With all due respect, it is not the extent of spread that determines the superiority of a classic. I am not talking about a sneering, contemptuous rarefied exclusivity. However it will be difficult to transfer the unique combination of emotions, backdrop and zetigeist to a different setting (read audience). Thus Pather Panchali will never be appreciated by non-Bengalees to the same extent that a Bengali would. By the same token, even the movies are, IMO, a pale reflection of the immortal, everlasting quill of Bibhutibhushan. The scene in Aparajito, when Apu learns of his mothers death, and first feels a sense of freedom, and then a crushing and numbing grief, can never be replicated on celluloid. Or the scene where Apu’s mother realises her death approaching, and studies it as death languourously curls up her body …. the equivalent movie scene is miles behind. The Trilogy’s appeal is nevertheless unfettered by time and grography. It is the story of a poor family’s deep love of their ofspring. It is the age-old tale of the cruel hand of fate, and how the indomitable human spirit endures. Most of all, its immortality lies in the last two words GB uses to conclude. It is simple. And it is pure. I am from mangalore, a coastal town of Karnataka State. I worked in Orissa for 6 years (1990-96). During this time most of my colleagues were Bengalis. I came to know about the rich culture and heritage of Bengali people during this period of 6 years. I used to hear about Pather Panchali from them. Today in 2011 September suddenly I came across the video in you tube of pather panchali while searching for something else. Then Once I started watching the first part (the video is of nine parts), I just could not stop. Now I am done with Pather pachali and watching the 5th part of “Aparajito”! I salute this great soul called Satyajit Ray. Superb movie. I can understand bengali and speak very well(my mother tongue is konkani and has lot of similarities with Bengali). I fully agree with gentleman who has analysed the Pather Pachali triology. extremely well written… probably a few lines could have been written for the music as well… apu trilogy is incomplete without the soulful music by Ravi Shankar. another thing i felt over the years is that probably even satyajit ray would not have made the film in colour. monochrome was so apt for this trilogy. My wife and I (elderly americans) just saw it as part of our world cinema class at a local university. It grows on you, almost becomes part of you. Helps me understand my India friends a little better. But what I really liked are the heartfelt and thoughtful comments above. Pingback: bingomad123 comments on "When Satyajit Ray Came to Hollywood"
Ohh man! Love this! Heart pours out…till eternity….